You’ll feel right at home the moment you walk through the front door! 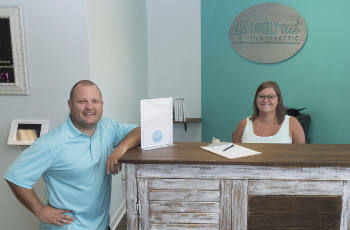 Since 2008, husband and wife chiropractors, Dr. Chris Aliment and Dr. Jen Aliment have been taking care of kids and families. The U.S. continues to move toward health care for sickness instead of focusing on staying healthy. It’s more important than ever to take care of Foley families so that kids grow up with healthy habits. At Family Tree Chiropractic, we want to take care of every branch in your family tree! We want to empower families to make healthier choices and live healthier lives. We educate our patients on a variety of topics to allow what they learn at Family Tree Chiropractic to have a positive effect on their entire life. Our philosophy is to help people in pain while getting people thinking outside the box for healthier living and making the choices that are right for their family. Families of special needs children can be torn apart by being unable to support their children, who can’t control what’s happening in their bodies. Parents of children with special needs even have a higher divorce rate. A family may find themselves feeling challenged and we’re here to help. Chiropractic can help your relationships improve and your special needs child to enjoy life and have fun. We love seeing children improve and reach their milestones. Your family’s quality of life will be higher than ever as your family cares about their health, together. Let us help your family reach health and happiness. Contact us today to get started!